I will be able to attend this season. (The others were Cleveland and Philadelphia). In looking at the map and trying to determine the places I would be able to see along the way, I found that Hell, MI was kind of on the way. As I noted in my trip to Cleveland to see the game there, I lost my vehicle in a bad accident and practically went through hell to get to Cleveland. This time, I LITERALLY went through Hell to get to Grand Rapids. For my route I also went through the oil country of Ontario on the way over and, as always, I spiced up the trip with an assortment of places to stop. The map below tells the geographical story of this two day adventure. (at least to some folks). By 7:30 AM I was on the Canada 401 Hwy heading west to London, Ontario where I would hop on the Canada 402. I took exit 82 and then headed via back roads through farmland towards Oil Springs, ON. A barn with an Airstream near Oil Springs, ON. Gotta love Airstreams…. I eventually made my way down Gypsie Flats Road and as I neared the intersection of Gum Bed Line I could smell the petroleum in the air. The first things I see are an odd variety of old and new oil wells and a number of metal sculptures depicting the early oil industry. These fit nicely into my “scrap metal folk art” collection so I got a number of photos of these. All of these were on the Fairbank Oil Properties, named after John Henry Fairbank, who started these fields in 1861. Apparently all of these metal sculptures were made by local metal-worker Murray Watson, who owns Watson’s Machine Shop in Oil Springs and each of the sculptures is supposedly based on a real person connected to the oil business in the area. I finally got into the small town of Oil Springs, which touts itself as site of the first commercial oil well in North America (they were celebrating their 150th anniversary in 2008, which celebrated the discovery of oil in 1858). Ironically, just a week earlier I drove through Oil City, PA and nearby Titusville, PA which has the same claim (they claim theirs was the birthplace of the Oil Industry in 1859). In any case, the oil wars continue today as I am (actually aren’t we all?) battling with $4.00/gallon prices in the U.S. and $1.30/liter (abt. $4.92/gal) prices in Canada. in Pennsylvania in 1859.) — This info comes from Petrolia’s Website. After visiting Oil Springs I drove north on Oil Heritage Road into Petrolia and then on to Wyoming. I had planned to stop in Petrolia, but I still had a lot to see so I skipped Petrolia and it was early anyway so the museum and other sites would not be open anyway. I got through Wyoming and was back on the 402 heading west towards Sarnia, into Point Edward and over the Blue Water Bridge. I have crossed this bridge a number of times, but have yet to actually stop and decided not to this time as well. There are some beautiful scenes of Lighthouse Park (in Port Huron, MI) and I think the park in Point Edward, ON would offer some nice shots of the lighthouse over the St. Clair River, which serves as the border between Canada and the U.S. Maybe on my next trip….. The drive to Hell, Michigan is actually quite scenic. You take D19 south to Patterson Lake Road and then turn right. This is about a five mile drive. Hell is actually located inside Pinckney Recreation Area near four or five lakes. It is also considered a part of the town of Pinckney. According to the official Hell Website, the town got its name as follows: Hell was first settled in 1838 by George Reeves and his family. George had a wife and 7 daughters – no reason to call it Hell yet… George built a mill and a general store on the banks of a river that is now known as Hell Creek. The mill would grind the local farmers’ grain into flour; George also ran a whiskey still, so a lot of times the first 7-10 bushels of grain became moonshine. In turn, horses would come home without riders, wagons without drivers….someone would say to the wife, where is your husband? She’d shrug her shoulders, throw up her arms and exclaim, Ahh, he’s gone to Hell!” In 1841 when officials from the State of Michigan came by, and asked George what he wanted to name his town, he replied, “Call it Hell for all I care, everyone else does.” So the official date of becoming Hell was October 13, 1841… (you can click here for the LONG history of Hell). Well, arriving in Hell was not as exciting as I thought it would be. There are only three businesses operating there (that I could see). The population is around 74 they say. As well, according to the Screams Ice Cream shop the locals are referred to as hellions, hellbillies or wannabes. Company. Their record is for the world’s largest “Teddy Bear Mosaic”. They also have “Goliath”, the World’s Largest Stuffed Teddy Bear (over 10 feet tall!!) and then there is the 7′ tall “Happy” Grizzly Bear. Naturally, I got Chelsea a T-Shirt that she can wear proudly! Chelsea is also home to one of my wife Julianne’s favorite products for use around Thanksgiving and when she makes chili. It is the home of the Chelsea Milling Company, known for their Jiffy Muffin Mix. model for the Cream of Wheat box. In June 2007, a headstone was erected for Mr. White. The headstone contains his name and an etching taken from the man depicted on the Cream of Wheat box. I made my way into town and then to Woodlawn Cemetery. There are two roads in, one paved and one dirt. Take the dirt road under the Woodlawn Cemetery sign and take the fork to the right. His is the first marker on ground on the right just off the road. becoming a citizen in 1890. White lived much of his life in Leslie, Michigan, and was working as a master chef at a Chicago restaurant the time he was photographed for the cereal box in 1900. White died on February 15, 1938, and is buried at Woodlawn Cemetery. In June 2007, his grave, which was previously unmarked, received a headstone. Now when you eat Cream of Wheat you can have this interesting story to tell. (Please make mine lumpy!) He apparently never made a penny off of his image. just south of Lansing and then onto I-96 to head further west through Portland, Berlin and Boston, to Exit 43 where I would head north to Ada, MI. 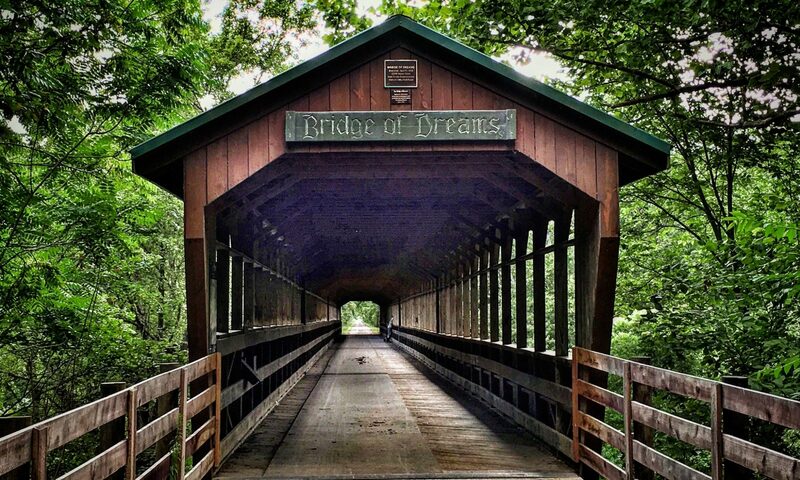 Ada is home to one of 11 covered bridges in Western Michigan. The Ada Covered Bridge spans the Thornapple River that runs through Ada. It is 125 feet long and was originally built around 1867 using “Brown” trusses that were patented by Josiah Brown of Buffalo, NY in 1857. This particular bridge has had its troubles through the years and was eventually destroyed by fire. The community, with help from nearby Amway Corporation, rebuilt the bridge in 1979. This bridge is only for pedestrian use now. well as a ride west towards Lake Michigan. We made it to about 100 yards of the lake and didn’t know it and it was dark anyway. It was a pleasant time talking about family, life, football, etc. June 1, 2008: Today was game day, but it was beautiful outside and so I decided to take a drive to see another of the covered bridges. I had hoped to find it yesterday, but I got lost and it wasn’t signed very well. This time I had specific directions and drove east on I-96 to the Lowell exit 52 and headed north through Lowell up Lincoln Lake Ave. to Fallasburg Park Dr., about 5 miles north of Lowell. This is the site of the Fallasburg Covered Bridge. This bridge is a single span bridge also using Brown trusses. It is 100 feet long and 14 feet tall and allows single lane traffic by car as it crosses the Flat River. But, if you go faster than someone walking you will be “fined $5” according to the sign on the bridge. When I got there I was awestruck by the beautiful setting. On top of that, there was a man there fishing and the shot was too tempting. Barry O. gave me permission to photograph him and use it on the web. Crossing over the river on the bridge and then up the hill takes you into the historic village of Fallasburg. There are some historical buildings. After a nice morning visit, it was time to head back to Grand Rapids to get the tickets and get excited about the ball game. The Utah Blaze really needed a win here to stay in contention for the playoffs. First of all, I sat on the “Blaze Bench” in Hell for good luck (see photo at top of page). I had yet to attend a game played by Aaron Boone as an Arena player that they had won. I was 0 for 5. So, I hoped my streak would be broken. I had to go through Hell to get here!! The game went well. The Blaze won 63-56 over the Grand Rapids Rampage though Boone’s Touchdown streak was held to 13 games in a row as he didn’t get one this game. But, my streak was broken and better yet, the Blaze stayed in contention for the playoffs! Following are a few photos I took at the game. I had great seats right behind the Blaze bench. Coach Danny White attended Westwood H.S. in Mesa, the same as my wife. My mother-in-law was one of his high school teachers. Germaine is also from Mesa and led Ohio State to a Rose Bowl win. After the game I saw Aaron off and headed home. It was Sunday and I had to be back at work in the morning. However, on the way home I had one more place to visit. I needed dinner, so I would stop at a planned place. I discovered this one on roadsideamerica.com and thought it would fit my eclectic style. Yes, the name conjures up all kinds of imaginations. But, as with other strange and wonderful places I have visited in the past, I needed to add this to my collection. (Note: As of this writing in 2015, the restaurant is closed, but is trying to reestablish in Lansing, MI) The TCIR and Tuba Museum not only has an interesting interior, but the menu is also a variety of Asian, ethnic, Greek, and whatever else they could conjure up. I actually had a Greek salad and a Buffalo burger…yes, Buffalo…not in Montana, South Dakota or Colorado…but in some little small town in Michigan! It was spring and the flowers were in bloom and the fountains were running. It was a pleasant ending to a rather long weekend. Eye candy, good food and wonderful fragrance. The drive back to Woodstock was uneventful and went quickly. It was a great time.